Chatter is an enterprise social network and collaboration environment. Force.com exposes various useful information from Chatter such as users, organizations, groups, feed-items through APIs. Using this information, we can build a proof-of-concept dashboard which will show a user’s or organization’s feed in real-time. Real-time dashboard can provide an accurate understanding of what is happening in an organization. This tutorial expects that you are an intermediate-level web application developer and have a few weeks of experience with Rails and related ecology. This means you should be familiar with building blocks of a Rails app and terms like OAuth, REST, Callback, bundler, gem etc. User can login to our Rails4 powered dashboard (a connected app) using ‘Sign in with Salesforce’ (Oauth 2). We use OAuth to get a secret token for each user from salesforce.com. We can use the token to call APIs. Our goal is to receive a callback to server whenever anything is posted on Chatter. Unfortunately, Force.com doesn’t support a PushTopic for FeedItem, so we will use a work-around to trigger a callback whenever a FeedItem is created. First, we will create a trigger on FeedItem, this trigger will create a custom object named ProxyFeedItem, which will copy necessary fields like body, time, parent_id etc. from the FeedItem. 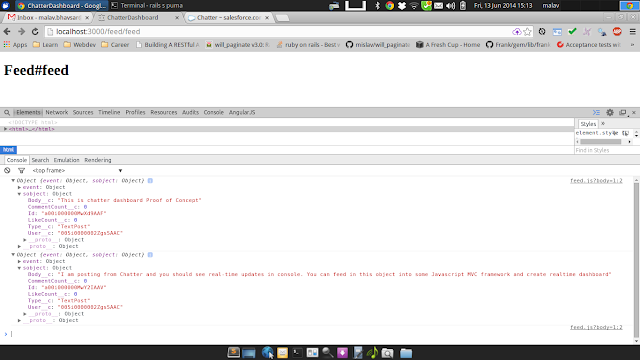 Using a faye client embedded in restforce client, we will listen to a PushTopic for ProxyFeedItem. ProxyFeedItem will be created whenever there’s an update to any FeedItem. 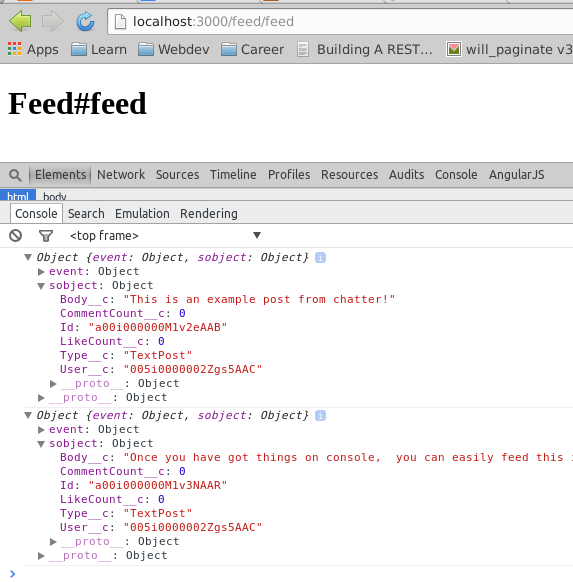 This will send a callback to the server with data of the ProxyFeedItem. We will need to forward this incoming data to user’s browser. We will set up another faye channel and just transfer the data we received in step 4. First, go to https://developer.salesforce.com/signup and register for your free Developer Edition (DE) account. For the purposes of this example, I recommend sign up for a Developer Edition even if you already have an account. This ensures you get a clean environment with the latest features enabled. After sign up, make a connected app by following the directions found in this article from the salesforce.com developer portal. Use http://localhost:3000 as Start URL, enable Oauth settings, select appropriate permissions and use http://localhost:3000/oauth/salesforce/callback as callback URL. When you create your app, you will get the app’s Consumer Key and Consumer Secret. Run bundle install, which will install additional dependencies. To start our server, run rails s puma; this will run rails with a puma server and you should be able to see a welcome page on http://localhost:3000. This configures our omniauth and omniauth-salesforce gems. It has basically added a middleware in our Rails application, which will handle Oauth for us. You can read the documentation for these gems to dig deeper. In the first section of the tutorial, we set up Oauth with salesforce.com and created a restforce client object. In this section, we want Force.com to notify us of any changes in the FeedItem object of Chatter. Unfortunately, Salesforce streaming API doesn’t support FeedItem yet, so we will have to do a work-around. Whenever this is triggered, we get the data from Trigger.new iterate over it and create our custom object ProxyFeedItem for each FeedItem in the data. Now, we have to create a PushTopic, which will listen to any changes in all ProxyFeedItem (and in turn FeedItem) We will subscribe to this PushTopic and send the changes to browser. Query: "SELECT Id, Body__c, CommentCount__c, LikeCount__c, Type__c, User__c from ProxyFeedItem__c"
Start our Faye server in a different console. This will handle pub-sub for us. Now, go to http://localhost:3000, ‘Login with Salesforce’ and you will end up on the feed page. 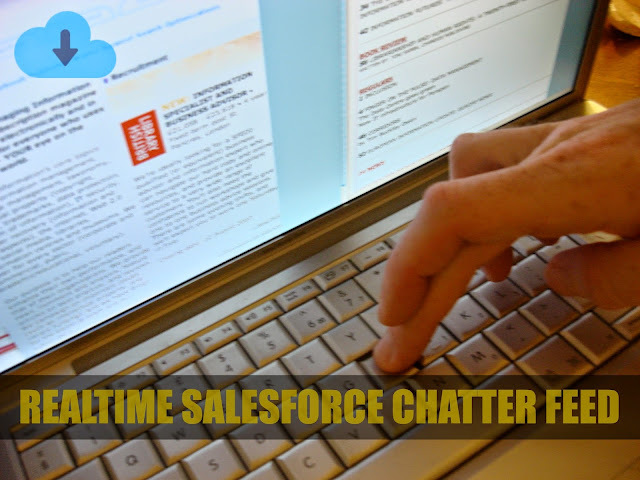 Open the developer console and in another tab open the Chatter tab of salesforce.com. If you do a text post, you will be able to see a real time update in the console. Instead of printing data in console, you can easily feed it into any frontend framework like angular, ember etc. and create a great real-time dashboard. We also have left out few things in this proof-of-concept prototype e.g. we have to secure our faye channels. One way of doing this is creating a different channel for each user. e.g. /messages/new/user_id and subscribe the user only to that particular channel. Additionally, use SSL. If you are handling any real user data, it is important that you secure the data being transferred. Force.com makes sure to secure the data and only provides developers with data over SSL using OAuth. It is however the responsibility of the developer to ensure secure communication in any RESTful app. For more information, you should refer to Security Resources.